As I thought about this I began to realize that there had been a lot of big screen kitties this year. The New York Times notes in their review that “cats are the new dogs,” and judging from the list of animals in this article, they might be right. But as I started to think about it more, it wasn’t just cats but dogs and some actually amazing performances by other animals in this past year of film. So the list of best animal performances of 2014 grew and grew. After the jump you will find my examination of why 2014 was the year of animal movie performances and what it all means. This list is not ordered or ranked. We attempt to break down how the animals played a role in their respective film, using excerpts from reviews and editorials to highlight theories and interpretations, sometimes ridiculous. Spoiler warning: Possible spoilers may be discussed for any of these films, so if you haven’t seen the movie and are spoilerphobic, skip the text of that entry. In Mockingjay, Katniss returns to District 12 to see the destruction. While in her old home district, she also drops the remains of her old house to pick up a few things — and that is where she finds Buttercup, her sister Primrose Everdeen’s cat. She remarks that of course the cat survived and not Prim’s goat because the goat actually served a purpose in the household. But the cat nearly kills them both when Prim goes back to get the cat when the capitol is bombing the underground headquarters. They all survive and despite rules against the practice, Katniss makes a deal to keep the cat in the bunker. Buttercup didn’t have a huge part in the overall plot of Mockingjay but her appearance has been the topic of much fan debate. The cat was originally black-and-white when she appeared in the first Hunger Games movie, but series author Suzanne Collins asked to have it changed to an orange cat as she had described in the books. Director Francis Lawrence followed through on this request, angering some fans. But Hollywood casting ginger cats seems to be a new Hollywood trend. The cat is so popular in the Hunger Games fan community that fans have created a character poster for her, seen above right. 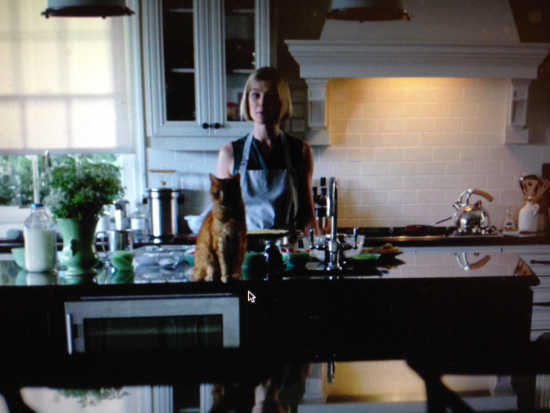 There is perhaps no cat more majestically photographed than that the animal owned by Ben Affleck’s character Nick Dunn from David Fincher’s Gone Girl. The house cat, named Bleeker in the book, has a significant amount of screen time, watching silently as the couple’s marriage collapses. Later, he peers outside watching the media circus unfold. John Powers writes in Vogue that the cat is “an emotional marker” and HelloGiggles suggests that his placement in scenes is strategic, swaying sympathy towards either Nick or Amy. The cat is actually the reason Nick comes home to find his living room trashed — a neighbor called him to let him know his cat had escaped and was wandering around the front yard. Nick’s cat even has his own room in Amy and Nick’s rather large suburban house. Ben Affleck has joked that the real cat is “a half-dead cat” and David Fincher elaborated on that comment in the film’s audio commentary. I think this is truly inexcusable. That cat could act, yet Director David Fincher chose to snub it in the credits. What cat would just sit on a kitchen counter while Mr. Fincher requested the actors do a scene 20 times, plus or minus five? I don’t know if this happened for a fact with the cat, but I do know that no scene I appeared in was performed less than 15 times and most were well north of that. Why should a scene with a cat be any different? I suppose I could be unjustly blaming Fincher for not giving the cat credit. Maybe there was no actual cat used in the movie. Perhaps, the cat acted so perfectly, because it was CGI, a total electronic creation of bits and bytes, the only differences from a bloodthirsty T-Rex in “Jurassic Park” is that e-Bleeker is a lot smaller, cuter and much better behaved. Far fetched? Possibly, but there are six different special effects companies and their couple hundred employees listed in the credits as working on “Gone Girl”. They had to do something. A CGI cat is the only explanation I can fathom as to why no cat or cat wrangler is listed in the credits. Practically everything and everyone else is listed. All the promotion for St. Vincent has centered around Bill Murray. It makes sense: He’s the star of the movie; and he’s Bill Murray, the internet’s favorite uncle. However, those who’ve seen St. Vincent know Murray isn’t the breakout. And, no, it’s not the little kid. It’s the cat. Murray’s character Vincent has a cat named Felix, and it’s the best cat, full stop. He’s just a wonderful, fluffy, lush Persian with a face so grumpy, it makes Bill Murray at the beginning of Groundhog Day look like Bill Murray at the end of Groundhog Day. You can see some behind the scenes photos of Murray holding the cat at arms length on shadeddreampersians.